The portable pyrometers of DIAS PYROSPOT series 80 are suitable for temperatures from 200 °C to 3000 °C in heavy industry under rough conditions. 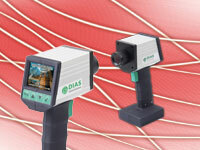 You are able to reach every measurement point with this portable and robust device and you stay flexible. Together with an integrated video module a color TFT display enables an easy and correct alignment of the pyrometer to the measuring object. This is safer – especially in harsh industrial environments than the view visors often used in high temperature pyrometers. What characterizes the devices of PYROSPOT series 80? For temperature measurements from -35 °C to 950 °C in the standard spectral range from 8 µm to 14 µm, we recommand the portable pyrometer Testo 845 of our cooperation partner Testo.